Raised in Miami, Florida, Enzo Dalmazzo earned his Electrical Engineering degree at Florida International University and later studied Organizational Leadership at the University of Oxford – Saïd Business School. For over a decade, he worked for several US Mobile Operators, serving multiple functions in their RF Engineering Departments. His core responsibilities were to ensure high quality service and maximize coverage, or in other words, more “bars” and fewer customer complaints. More “bars” and fewer complaints took a new direction for Enzo when he found himself in a daunting situation while living in New York City. Hurricane Wilma took land fall across South Florida in 2005, wreaking havoc in his home town. “The news came to me like a wake-up call, this gave me another reason to come back home to South Florida.” Says Enzo, who almost immediately gathered RF Engineers and Tower Crews together to restore service after the hard hit to the telecom industry. 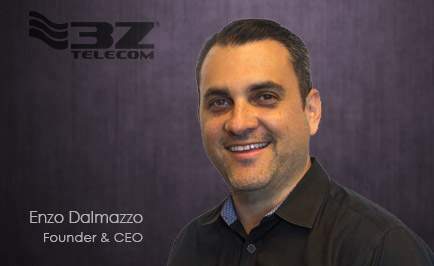 Enzo and his crew rolled up their sleeves and began with the rebuilding and reconnecting process, realigning hundreds of antennas and restoring services for the mobile users in the area. He worked side by side with the team who was tirelessly ascending and descending those towers. It was during this time when Enzo had what can only be described as a “eureka” moment. He understood that the quality of service that mobile carriers offer is directly affected by the accuracy of antenna alignment during installation and the importance of keeping those antennas aligned long-term. If antennas shift or tilt by just a couple of degrees, network performance dramatically suffers. Enzo wanted better tools, he was in search for something that could help his crew save time and eliminate the need for “go-backs”, the industry term for going up and down the tower to realign the same antenna. Enzo began looking for a smarter option, something more efficient for the tower techs to use. However, after much investigating and testing of several antenna alignment tools, he found that none of the available devices met his criteria. “Most of them were too bulky and heavy, which made them unsafe and cumbersome to operate for tower techs. They were designed and made by engineers for engineers, not the tower techs. No, they were not user-friendly,” he added. Echoing the words of Steve Jobs, who said: “Create tools that are simple enough for people to harness the power of technology.” Dalmazzo applied his vision of empowering others through innovation and simplicity, designing the tool that would disrupt the industry and fill the void for an easy-to-use antenna alignment tool that was smaller, lighter and technology packed. In 2012, 3Z Telecom successfully launched their first antenna alignment tool. Rapidly selling thousands of the product branded, 3Z RF Aligner, which is currently recommended and approved by over 30 top mobile operators and OEMs worldwide. Shortly thereafter, Enzo focused on helping companies monitor antenna alignment. There was no simple way for mobile operators to become aware of any issues with antennas moving out of alignment due to weather or poor installation, making it a costly and labor-intensive process. Consistent with his philosophy, Antenna WASP, the world’s first Wireless Antenna Monitoring Sensor System, changed that. Enzo views problems and challenges as opportunities, always believing that there is a better and more efficient way in doing things, even when it comes to his own ingenuity. Just five years from the introduction of the 3Z RF Aligner, Enzo has reinvented the antenna alignment tool as we know it once more. The RF Vision, which was announced during an exclusive reveal in February 2017, is the first of its class to incorporate dual frequency technology and a built-in camera with augmented reality. Today, Mr. Dalmazzo holds several patents for his inventions and continues to revolutionize the industry standards with his forward thinking and simplicity.